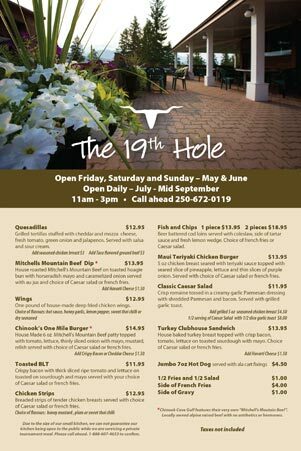 Chinook Cove Golf & RV features a licensed restaurant with seating available inside, or outside on our beautiful patio. Enjoy delicious burgers, fries, wings, salads, chicken fingers and more. 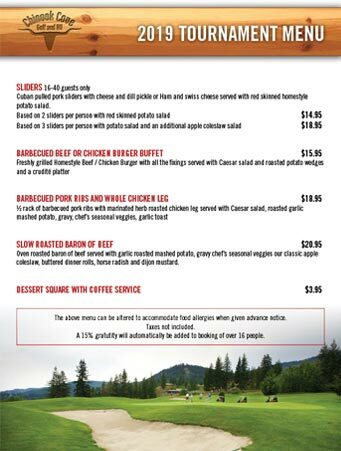 Click on our menus below to uncover our full selection. Due to the size of our small kitchen, we can not guarantee our kitchen being open to the public while we are servicing a private tournament meal. Please call ahead 1-888-607-4653 to confirm.